The West Linn girls basketball team did exactly what it wanted to do at the start of its Friday contest. The sixth-ranked Lions, hosting No. 5 Three Rivers League foe Tigard, knocked down their first five shots from the floor — including three 3-pointers — and built up an eight-point lead midway through the first quarter. But the Tigers had the last laugh — in a big way. Tigard outscored West Linn by 25 points in the last 3 1/2 quarters of the game and rolled to a 63-46 victory at West Linn High School. "We had a slow start, but once we got our defense going, I think our defensive intensity really gets us moving in a game, gets us flowing into our offense," said Tigard senior guard Campbell Gray, who led all scorers with 24 points on 10 of 18 shooting from the floor (including two 3-pointers) and a 2 of 2 day at the line, along with three steals and two assists. "It was huge," added Tigard junior guard Kennedy Brown, who added 12 points on 3 of 9 shooting from the field and a 6 of 6 day at the line. "I think we did a really good job just knowing where their players were and (senior post Dani Lyons) had a great game." With the win — the team's fourth straight — the Tigers improved to 2-0 in TRL play and 11-2 overall. West Linn, meanwhile, saw its four-game winning streak snapped and fell to 1-1 in league and 8-4 overall. "Turnovers were a huge thing for us," said West Linn junior wing Elisabeth Dombrow, who led her team with 14 points on 4 of 7 shooting from the field (including three 3-pointers) and 3 of 4 foul shots. "That's probably the most turnovers we've had yet this season, and against a team like this, that's not what we need." "It meant a lot to us," added sophomore guard Peyton Shelstad, who finished with eight points on 3 of 10 shooting (including two "3s"). "We've been preparing all week and we wanted to beat them here because it's easier to beat them at home and we want to win the league." 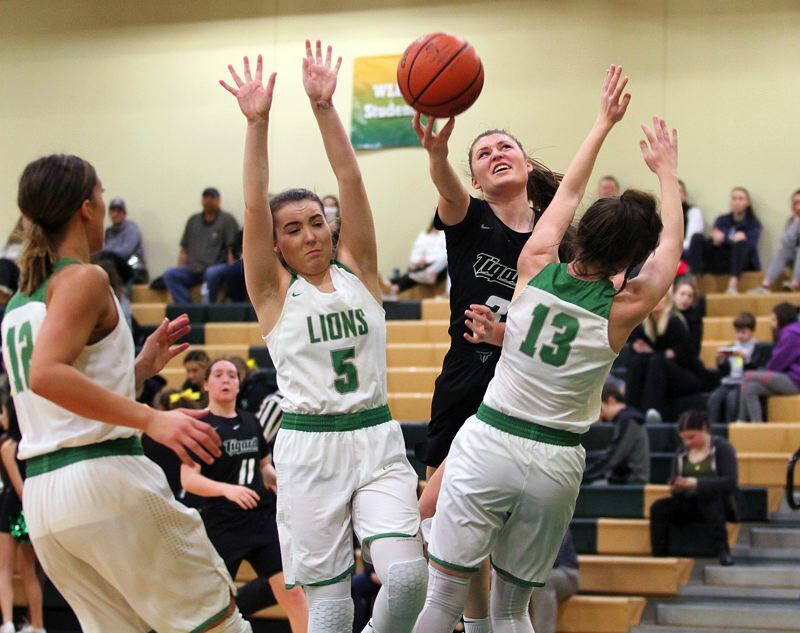 As to that fast West Linn start, the Lions knocked down their first five shots, with Dombrow burying two 3-pointers, sophomore post Aaronette Vonleh scoring twice from the field and sophomore guard Audrey Roden adding another "3" to give their team a 13-5 lead with 3:49 left in the first quarter. But the Tigers awoke then and there, closed the quarter on an 18-2 run that gave them a 23-15 lead at the end of the period, with junior guard Delaney Leavitt scoring 10 points in the final 3:25 of the stanza (including a pair of 3-pointers) while Gray and Lyons both added "3s" of their own. While the Tigers closed the opening quarter with a flourish, the Lions weren't done yet. They kicked off the second period with a 7-4 run that included a Shelstad 3-pointer, a Roden drive and a Dombrow putback that cut Tigard's lead to 27-22 with 4:29 to go in the half. The Tigers led 30-22 at the break and were still ahead just 36-26 when Vonleh hit two free throws with 4:57 to go in the frame, but Tigard closed the quarter on another big run. This time, the Tigers stitched together a 13-2 run highlighted by 3-pointers from Leavitt and Lyons, and capped by an Ajae Holdman foul shot that gave Tigard a 49-28 lead with 1:54 remaining in the period. The Lions got no closer than 12 points — at 57-45 when junior Vanessa Viukhola scored off a Katie Schoenborn pass with 1:27 remaining in the game — in the final quarter. After the game, the Tigers said their defense — which held Vonleh to 13 points and forced 24 turnovers — played the key role in their victory. "(Lyons) is a phenomenal post defender and (defensively, we did) the same thing we do with Southridge — we ran a 1-3-1 zone and tried to get two on the post at all times," Gray said. "We were in a 1-3-1 … so (Vonleh) wouldn't get in the middle, but we also wanted to get out on Roden and their shooters," Brown added. On their side, the Lions — who played without sophomore point guard Cami Fulcher due to a high ankle sprain — knew they'd given the ball away too often and knew they hadn't used Vonleh to her greatest effect. "We had 24 turnovers and I just think that causes a lot of problems … and we weren't really getting back on defense when they got turnovers," Shelstad said. "The first half, getting it to Aaronette, we did not do a good job," Dombrow added. "(It was) turnovers and rebounding. They outrebounded us by one board, but our coach always says if we get outrebounded, it's a lost game." For the game, Tigard went 23 of 50 shooting with seven 3-pointers, hit 10 of 13 foul shots and committed just seven turnovers. In addition to Gray and Brown's efforts, Leavitt added 13 points in the win. For West Linn, the Lions hit 17 of 41 shots from the floor with six 3-pointers, made 6 of 11 free throws and turned the ball over 24 times. Vonleh added 13 points in the loss. Next up, Tigard plays at St. Mary's at 7 p.m. Wednesday, while West Linn hosts Tualatin at 7 p.m. Wednesday.